I love Key West and I love my art, and I love my awesome life. I am writing to share some things to consider when booking a body painter in Key West…. whether for Fantasy Fest, a party, event or just something artistic. I get calls from various potential clients regarding body painting and obviously pricing is a consideration . Before that, please consider professioalism, experience and hygiene…. PLEASE consider hygiene. To me , as an artist in business for over a decade and working with the public and applying face and body art, its super important to use high quality art make-up and clean my brushes throughout the process of body painting. Furthermore, I do ask clients to wear undergarments on the bottom if they would like to be painted in that area. 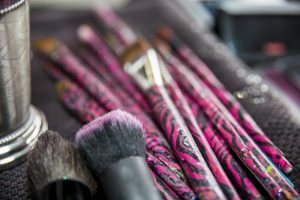 If its essential the design for body paint to be applied in an uncovered private area, the brushes will NOT be used on another client. I also only work with a water based art make-up, no liquid unless its running through an airbrush. The materials I work with are activated with water. Therefore after spraying the make up cake with water to achieve the consistency I prefer, I then use my sanitized brush to load the make-up on and then apply. In my opinion , liquid make-up or liquid body art material is a haven for bacteria. I am interested in only safe, sanitary body art practices. The other awesome thing about using high quality make-up cakes is that they can be wiped clean after each client or each use. All I have to do is take a hygienic wipe and sweep the top layer clean….all good! I felt the urge to draw attention to the topic of sanitary body painting on the island of Key West. I see ALOT of body painting going on, especially during Fantasy Fest. I think its our responsibility to be educated on what is being applied to our skin and bodies. 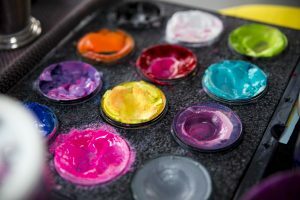 Over the the years, I’ve had clients tell me they had materials from other body painters that they couldn’t get off, that stained their skin for days, and one client expressed needing bottles of rubbing alcohol just to get art off of her body. Please understand, high quality body art make-up is durable and will withstand normal activity but IS removable with soap and water in a shower like normal people do, simple as that. Please beware of artists using airbrush T-shirt paint (Createx) on your body , or acrylics… acrylics are for canvas, not skin. If your interested in booking a body paint session while in Key West with Key West Artist and Body Painter Jennifer Montgomery call 610.764.0853 or visit my body paint page to see my work and contact page . Fantasy Fest body paint appointments are encouraged well in advance due to the popularity of that service and the crowd. Body paint during other times of the year is more flexible, I travel to your hotel or resort fully equipped to body paint your requested design, you get ready and then you go out and enjoy beautiful, sunny , Key West!!! See you in Paradise!!! This entry was posted in Body Painting, Parties and Events and tagged 2017 Fantasy Fest, Airbrush Key West, Body Paint Key West Fantasy Fest, Body Paint Key West FL, Body Paint Party Key West FL, Body Painted Costume Key West, Body Painting Key West, Duval Street Body Paint, Duval Street Body Paintiing, Fantasy Fest, Fantasy Fest Body Paint Appointments, Get Body Painted Key West, Key West, Key West Artist, Key West Body Art, Key West Body Painter, Key West Body Painter Fantasy Fest, Key West Fantasy Fest. Bookmark the permalink.